It's spring training, so everyone can dream. And the biggest dream shared in the early days of New York Yankees camp was the one about Michael Pineda. "I want to throw 200 innings this year," Pineda said, per Erik Boland of Newsday. "That's my goal." Everyone can dream, even a guy who has had so much trouble staying healthy he has totaled 408 innings in the five seasons since he made his major league debut. He didn't pitch at all in two of those seasons, but that's still only an average of 136 innings in the three seasons he did make it to the mound. Is there anything certain in this Yankee rotation? The high-end possibilities are exciting enough that it's possible to see the Yankees as a playoff team in 2016. 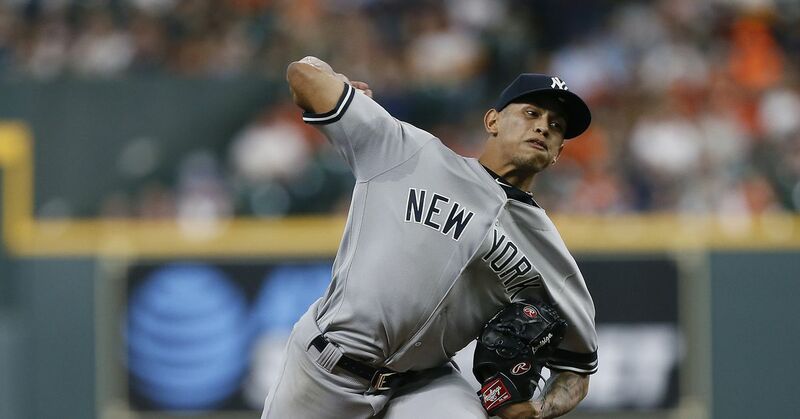 Pineda was brilliant at times last year, including in a 16-strikeout game against the Baltimore Orioles. Eovaldi looked like a breakout star until elbow problems ended his season. Tanaka had enough good starts that people stopped demanding he be given immediate Tommy John surgery to repair his partially torn ligament. Luis Severino looked so good in his 11 starts that he could have been the choice to start the Wild Card Game. CC Sabathia pitched better once they found him a good knee brace. Give these guys 200 innings each and you've got one of the best rotations in the game. But can any of them pitch even 170 innings? Last year, not one of them did. The only other team in baseball without a 170-inning starter was the Colorado Rockies. There's so much uncertainty here that when columnist Joel Sherman of the New York Post went searching for a Yankee pitcher who might qualify for the ERA title (minimum 162 innings) with an average or better adjusted ERA, he came up with Severino as the most likely possibility. He took the kid, the guy who turned 22 just this week, the guy the Yankees have treated so carefully that his 161.2 combined innings in 2015 were easily a career high. At least Severino didn't spend any time on the disabled list. He's the only Yankees starting pitcher who can say that. Most of the focus in Yankees camp has been on the bullpen, and especially on Aroldis Chapman. That's understandable, because the bullpen is exciting, and Chapman is the newest reason it's exciting—and he's potentially facing a suspension for a domestic violence incident. But the Yankees bullpen was one of baseball's best last year, with only 12 blown saves (tied with the Cleveland Indians for the fewest in the majors). And while the back end of the bullpen may be more exciting with Chapman, the overall pen may not be any deeper. No matter how much the Yankees talk about shortening games, and no matter how much baseball has embraced the bullpen game that helped the Kansas City Royals win a World Series, the bigger key to this Yankee season is whether the fragile rotation holds up. They'll need innings out of their starters, and more than that they'll need starts out of their starters. The trade for second baseman Starlin Castro cost the Yankees Adam Warren, who was part of their bullpen depth but was also a useful fill-in for the rotation. General manager Brian Cashman went into the winter hoping to acquire a controllable young starter, but it was the one goal he couldn't accomplish. For now, the Yankees have six starters (Tanaka, Sabathia, Eovaldi, Pineda, Severino and Ivan Nova), and little reason for confidence in what comes behind them. Besides Sabathia, who is 35 years old with bad knees, they have just one pitcher who has made 30 starts in a major league season. Eovaldi started 33 times for the Miami Marlins in 2014, then dropped back to 27 starts in 2015. Maybe this is the year they all stay healthy. Then again, spring training has just begun and the Yankees still aren't sure Tanaka will be ready for Opening Day. Maybe he will be. Maybe Sabathia bounces back. Maybe Severino carries last September's success over a full season. Maybe Eovaldi's elbow holds up. And maybe this is the year Michael Pineda really does throw 200 innings. Hey, it's spring. Everyone can dream.